JEDDAH, 26 September 2004 — Yassin Abdullah Al-Qadi, a highly-respected Saudi businessman and benefactor, has won a legal battle against the office of the Swiss federal prosecutor at the Swiss Federal Criminal Court, a press statement issued by his lawyers said yesterday. Al-Qadi filed a lawsuit against the prosecutor after he uncovered the appointment of Jean-Charles Brisard by Deputy Swiss Attorney General Claude Nicati as an expert in his investigation into allegations that Al-Qadi had financed terrorism. “By a decision of Sept. 21, 2004, the Swiss Federal Criminal Court unanimously ruled in Al-Qadi’s favor by ordering that Al-Qadi’s lawyers be granted full access to Nicati’s entire file including all notes taken by Nicati of his meetings with Brisard,” the statement said. The court also ordered the office of the Swiss federal prosecutor to pay compensation to Al-Qadi and ruled that Al-Qadi be reimbursed his court expenses. “I am delighted at the decision of the Swiss Court which upholds my complaints about Nicati’s conduct,” Al-Qadi said. “I am completely innocent of all allegations against me and hope that the Swiss authorities will now close their file,” he added. Before taking legal action, Al-Qadi’s lawyers had asked Nicati to take a number of measures including the immediate revocation of the appointment of Brisard as an expert. They argued that Brisard’s appointment contravened Swiss law and the basic principles of procedural fairness. “Brisard is the lead investigator for the US lawyers in the civil action brought in the US courts on behalf of the families of the victims of the Sept. 11, 2001 attacks and cannot therefore be regarded as independent,” they said. “Of particular concern to Al-Qadi was his discovery that Brisard passed to US lawyers documents he received from Nicati’s file in his capacity as expert,” the statement said. Al-Qadi’s lawyers also drew Nicati’s attention to false allegations promoted by Brisard concerning Al-Qadi and other Saudi businessmen. After Tuesday’s court verdict, Nicati conceded unreservedly his agreement to renounce the mandate he had given to Brisard, ensure the return of all documents and material which Brisard has obtained from Nicati’s file, and obtain a solemn undertaking by Brisard not to keep any copies of any such material. However, Nicati persisted in his refusal to comply with Al-Qadi’s other demands. Al-Qadi, who was listed by the FBI among individuals allegedly linked to the Al-Qaeda organization, said the inclusion of his name in the list without any evidence was tantamount to human rights violation. 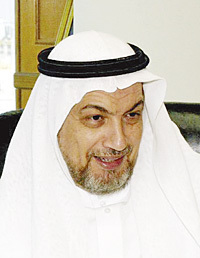 “I don’t have any connection, be it close or distant, with Al-Qaeda or its leader Bin Laden, either directly or indirectly,” Al-Qadi told Asharq Al-Awsat, a sister publication of Arab News, in an interview. The FBI distributed a list of 39 individuals and groups, seeking a freeze of their assets. According to the US Treasury Department, Al-Qadi’s name was put on the list for running a charity named Mowafek Charitable Foundation which it said had allegedly funneled millions to Bin Laden. Al-Qadi said he believed that his name was included because of his position as a founding member of the foundation, which was closed down several years ago. Al-Qadi’s friends have expressed happiness over his court victory and denounced the move by certain individuals and media institutions in the West to unjustly incriminate Saudi businessmen and organizations providing false evidence.